Representing one of the most agriculturally bio-diverse nations in the world, India has become a primary target for biotechnology companies like Monsanto and Cargill to spread their genetically-modified (GM) crops into new markets. However, a recent France 24 report explains that the Indian government has decided to take an offensive approach against this attempted agricultural takeover by suing Monsanto for “biopiracy,” accusing the company of stealing India’s indigenous plants in order to re-engineer them into patented varieties. In response to Monsanto’s release of the company’s first genetically engineered sweet corn for human consumption, a coalition has collected more than 264,000 petition signatures from consumers who refuse to purchase the corn and are asking retailers and food processors to reject it. Two major national food companies, General Mills and Trader Joe's, have already indicated that they will not be using the Monsanto GE sweet corn in their products, according to replies the companies sent to a request from the Center for Environmental Health. The Peruvian parliament has just approved a 10-year moratorium on cultivation or importation of GMOs. The justification: to protect the country’s biodiversity. How often do we see ecological priorities put ahead of economic or political ones? The proposed ban, that awaits final sign off by President Ollanta Humala, will prevent the importation for cultivation of GM seeds, livestock, and fish. Pharmaceutical drug production has undergone major changes following the development and approval of drugs called ‘biologicals’ that are for the most part proteins produced by genetic engineering. Biologicals make up at least a quarter of new drugs approved, though they are about twice as likely as chemical drugs to experience regulatory action following approval. The recombinant protein drugs are produced using viruses, bacteria, yeast, and cell cultures from insects, rodents, primates or humans. The use of genetically modified crop plants to produce biologics has been an attractive prospect because the crops are capable of producing vast quantities of recombinant proteins at low cost. There have been a large number of such transgenic ‘pharm crops’ created in the laboratory and field trialled, though none have been approved for commercial drug production. However, some have now progressed to clinical trials. The Food Hospital has not been shy to demonstrate medicinal effects of foods that are often depicted as the sole preserve of drug therapy. Patients with long-term and serious problems are shown undergoing major or complete recovery in a matter of days or weeks from starting their new diets. Suffice it to say that along with improving immune function and libido, zinc has been found to be beneficial in prevention or treatment of a variety of cancers, prostate cancer being especially researched on this front. It also has been relatively recently documented to shorten the duration of and greatly decrease mortality from acute infectious diarrhea. This last finding being researched to the extent that the oh-so-avant-garde World Health Organization now even recommends that zinc be part of any diarrheal treatment regime, though to my knowledge that recommendation is yet to take wide effect. A new policy brief faults prominent institutions and drug companies like Pfizer, Columbia University, Johns Hopkins University, and Population Council, for their involvement in unethical and illegal human experimentation in Africa. A new study shows that the only cancer cells killed by chemotherapy may be ones that are about to die anyway. Chemotherapy is standard treatment for most cancers. The study, “Heightened mitochondrial priming is the basis for apoptotic hypersensitivity of CD4+ CD8+ thymocytes” was published in the Proceedings of the National Academy of Sciences. It examined apoptosis, the natural and orderly process of cellular death. What I call the "Vaccine Construction" is a combination of Federal/State Agencies and Vaccine Manufacturers banded together into a HOUSE OF CARDS made up of certain foundational beliefs: The construction's whole current premise is made up of the idea that (1) vaccines are safe, (2) have always been safe, (3) they can be relied on, (4) the agencies can be trusted to look out for the public good, (5) that vaccines have an overlying wonderfulness that acts as a "Prevention" of disease, since, as they falsely claim "Vaccines have eradicated most diseases." If it can be shown that even one of these foundations is false, or even in question, the house of cards could blow over. This assault, questioning the validity of the original Thimerosal Studies, substantially attacks four of the five foundations (1, 2, 3, and 4). The World Health Organization’s announcement of self-destruct hypodermic needles reveals a secret they’ve kept hidden away for years: The vaccination program itself may be the single biggest cause of Hepatitis B infections in the world. 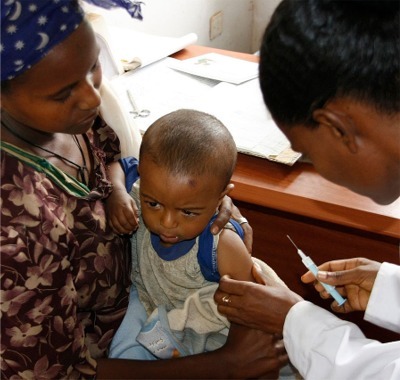 The pressure to vaccinate in developing nations has resulted in the routine reuse of needles. According to the WHO, about 21.7 million new cases of Hepatitis B, and 1.3 million deaths from it, are caused by the practice of reusing hypodermics. The entire vaccination program ignores that most vaccinations are not needed if people are healthy. When they have adequate nutrition, water, and sanitation, their health allows them to manage most of the vaccinatable diseases. When money is diverted into vaccination campaigns, then less is available to provide water, toilets, and food—the most basic requirements for health. The BMJ had supported Deer’s claim that Wakefield is the sole person responsible for claiming that nonspecific colitis was found in children with autism. Now, there’s incontrovertible evidence that the claim is not true. So, they are trying to railroad the rest of Wakefield’s research team, plus six “senior personnel at the highest level” of University College London (UCL) . Fiona Godlee, BMJ‘s editor, demands that UCL initiate an investigation immediately, and if they refuse, parliament itself should do so. Studies supported by the mobile phone and WIFI industries carefully avoid looking at the rather subtle, cell-level effects of signals that are pulsed (on/off) at low frequencies. But we must look at those effects if we want to have a wireless communications technology that is not damaging to health! CDMA cell phones do not pulse their signals. Dr. Moskowitz says “GSM phones emit about 28 times more radiation on average compared to CDMA phones according to one published study. Moreover, the toxicology research suggests that GSM phones are more biologically reactive compared to CDMA phones. “ Moskowitz recommends those wishing to reduce radiation from cell phones may want to switch to the CDMA carriers. “Until we get better preventive measures adopted, switching to a CDMA phone may be a simple way for some people to reduce their cell phone radiation exposure and risk.”, says Moskowitz. Apparently this option, to switch to a carrier that uses CDMA technology is available in much of the world, but not in Europe, where the (rival) GSM standard has attained very much exclusive dominance.